Individuals walk with the understanding that the surface underfoot is safe. When store managers or property owners are negligent in keeping the walking surface free of spills, cracks or foreign substances, people can fall and be seriously hurt. If you were hurt after tripping or slipping on unsafe or defective flooring, it is wise to seek the counsel of knowledgeable attorneys. What did you slip or fall on? What was the source of the substance on the floor? If water was on the floor, where did the water come from? If another substance was on the floor, where did that substance come from and how did it get on the floor? Do you have any evidence of how long the substance was on the floor? Are there any witnesses to your fall? Are there any witnesses that can testify concerning where the substance or condition came from or who created the unsafe condition? Is the area where you fell an area where customers of the store serve themselves? For instance, was it an area where customers pour their own drinks at a pop machine? Other type of self-service area? If you suffered an injury from tripping or slipping on broken or slippery surfaces, it is important to contact a skilled premise liability lawyer. We can listen to the facts of your case and provide you with educated advice and clear direction about how you should proceed. 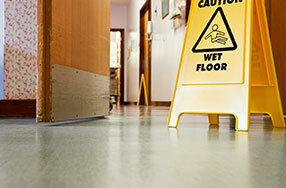 For more information or to schedule an appointment with an experienced personal injury lawyer regarding defective or wet flooring, please contact us.